The staff at the office were really kind and thankfully have a good sense of humor. They were very professional inall ways and at all times,but willing to listen and share a laugh with me. Dr. Goldsmith is very professional and seems to really know how to talk To a person,not At a person. I fully trust him and staff to do an excellent job on my hip. The staff at the office were really kind and thankfully have a good sense of humor. They were very professional in all ways and at all times,but willing to listen andshare a laugh with me. Dr. Goldsmith is very professional and seems to really know how to talk To a person,not At a person. I fully trust him and staff to do an excellent job on my hip. Dr. Scott Goldsmith joined his father, Stuart Goldsmith, MD in partnership in 2008 and specializes in total joint replacement, treatment of sports injuries and general orthopaedic surgery. 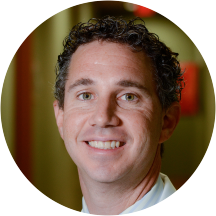 Dr. Goldsmith completed his residencies in New York, NY in orthopedic surgery sports medicine and general surgery. His has a doctorate of medicine and a master’s of science in applied physiology from Finch University in Chicago, IL and a bachelor of science in biology from the University of Michigan. He is printed in several publications including Foot and Ankle International and Journal of Arthroplasty. 2006- What Can Patients Actually Expect One Year After A High Performance Total Knee Replacement? I was dreading this visit as ortho offices are notorious for extremely long wait times. However, I was very pleasantly surprised by the relatively short wait! The office staff, and Dr. Scott were all super friendly and helpful! Dr Scott Goldsmith wasn't able to address my problem. He did refer me to someone else that can and I appreciate how he talked to me and talked to the other Dr about my problem while I was in his officeand planned my upcoming visit the to other Dr.
Dr. Scott is the best but the wait everytime I go there is always 1 to 1 1/2 hrs just to see him. He's a great Dr. but very frustrating with that long wait. My visit, although a long one, was good. The staff was very friendly and professional. I knew that they were listening to me and understood my concerns. Very compassionate and we're able to present me with several options for better quality of living. He didn't really give me much information which is why I went to the doctor. I am still wondering what is wrong with my knee. But the office staff was warm and friendly. I was seen at the Plant City by Matthew Smith who was really nice. He has great bedside manners and really knows his stuff. Everything was great up until my discharge. I was given a requisition to make an appointment foran MRI of my left knee. The first requisition was a receipt of a knee brace not a requisition form. So I had to drive back to the office and get the actual requisition form. Then that one had my name wrong and did not have a diagnosis code. Instead of driving back to the office I called instead. I spoke to someone very nice and very pleasant who really understood my frustration he said he was in Brandon office. He not only took care of the requisition form he even faxed it to central scheduling for me with CORRECT information! Then finally I was able to make an appt. I would highly recommend Dr Scott Goldsmith to anyone looking for an Orthopedic Specialist. His office staff is very on point as well as all of the nurses and various staff through out the back of the office. Just a briefstory about my visit, Dr Goldsmith had directed me to Tiffany who handles all of the scheduling. The only date they had was Feb. 2. As I was leaving, Dr Goldsmith was finishing up with another patient and had asked me if I had the date taken care. I told him the date and his response was no we are going to get you taken care of sooner than that. Now granted that may not happen in every single scenario, but the fact that he took the time to go and speak with Tiffany in scheduling was beyond what he needed to do. He came back out and my new surgery date is now Jan. 5. Thank You Dr. Goldsmith, and your staff for what you do each day. Dr Goldsmith took the time to explain everything in a very thorough manner. Gave me all options with regards to the condition I was dealing with. I would highly recommend him to anyone looking for an orthopedic doctor. I highly recommend this office and Dr. Goldsmith, very caring, he takes time to listen and to diagnose or give accurate treatment. Great Dr.visit considering they didnt even have an appt book for me. Excellent. All went well dr was great. Did not see Dr. Goldsmith. Had emergency school. Was disappointed that they could not continue treatment. They are not spinal surgeons. Have to find another doctor. Everyone was pleasant. Wife will probably go to Dr Goldsmith for hip replacement. The Doctor was excellent. There was a problem booking the appointment because they would not listen to me that I was on basic Medicare. They kept insisting that I have an advantage plan and I do not. I got to frustratedand went online to book the appointment. There wasn't an option in the insurance option box for my situation. It took the manager at the office to straighten the problem out. He was nice and told me what I needed to do. Wasn't up for surgery right away. So, was glad to hear the other options and the shot in my shoulder worked. Thanks to him and his team. Excellent Dr. & staff is extremely friendly and assertive. Highly Recommend!! I will continue making the 1.5hr drive for future appts with him due to his bedside manner & attentiveness. I was so happy with my visit at Dr. Scott Goldsmith's office. He was very thoughtful and complete with his exam. He took the time to answer my questions and make me comfortable about my up- coming surgery. I would recommend him very highly for hip replacement surgery. Doctor Goldsmith was phenomenal. The office staff was less than great however. My appointment was at 3. I arrived 20 minutes early to fill out paperwork but I wasn't even seen by the doctor until 5:15. I wasn't even going towrite this review, but now I stand at the pharmacy where the receptionist said she sent my prescription for pain but they don't have it. I called the office and was transferred to the answering service and was told I won't be able to get in touch with them until Monday when they return. I'm ready to scream. Get it together. Office was very busy today...but the staff and Doctor did their best to accommodate us. I love Dr Goldsmith he gave it to me strait. and that's a happy office every one is so nice and make shore your visit goes good. I was pleased. The dr seemed to have an interest in what is going on with my wrist unlike the last few I've seen, and he seems to want to correct the problem i am having. Dr Goldsmith was professional, courteous, and efficient. I felt confident in his diagnosis, and recommendations. Doctor was great. Very professional and friendly. All but one of the office staff was wonderful. Except for the receptionist. Very rude. No hello, please or thank you. Looked very unhappy. Being a previous office manager of a doctor office,I would not want her to be the first person patient's see. Receptionists should be friendly, polite and at least smile at you when you approach front desk. We saw Dr. Matthew Smith he was very pleasant, answered all our questions and was very comforting to our son. Really are sweet caring employees.The doctors are wonderful really explain so you understand your problem. It was great! Everyone was fast, efficient and professional! Very professional operation, from front desk staff and initial screening nurse/xray techs, to the associate doctor who rendered medical evaluation/treatment. Most definitely recommend...well done all around! Hooah! They were fast, quick, and professional. To start the doctor was great, friendly, explained things so I understood. My main complaint is the wait. My sons appointment was at 9:15 and we arrived at 9:05, I had all the paperwork already filled out when I arrived, andI know they had the films and referral already. So the wait began. I understand with speicalist that at times there are waits but after it had reached 45 minutes past our appointment time and the fact they were now calling people back that checked in after us I got up to go ask what was going on. While i was in line the lady at the front desk yelled out to my son saying "Kyle did you give me your paperwork?" I stepped into her view and said "yes i already had it filled out when we arrived an hour ago". She started shuffling paperwork and said "oh yes here it is I'm sorry I'll get you back right away". Another 25 minutes went by and 3 more people that arrived after us were called back before we were finally called back. Also during our wait we watched a patient show up check in, get her paperwork to fill out and sit there for 45 minutes filling out all the papers. Then when she took it back up the front desk lady then informed her that they couldn't see her because when her doctor sent the referall they didn't include the x-ray codes or they could see her but she could be responsible for the cost of the x-rays. The lady was now aggetated which I didn't blame her, the front desk lady obviously new this already but let her sit there for 45 minutes filling out paperwork, if she would of told her as soon as she walked in the patient could of called her doctor and got that faxed over while she was filling the papers out. The front desk just seemed unorganized overall. But once we got called back the other staff were great, once I told them how long we had been there because of the mix up they said they would try to get us bumped up. And the again the doctor clearly explained the accurate diagnosis and the treatment we should do and we were very happy. Very professional and right to the point. We discussed various options. I needed to be seen on very short notice and made an appointment 2 days prior to being seen. Very efficient and I would recommend not only Dr. Scott Goldsmith but also ZocDoc. The process of being diagnosed and scheduled for surgery very quick. Communication between doctor and physical therapy was very efficient, Dr. Goldsmith was informed of all progress. I was reluctant about South Florida Baptist, never having been there, but, pleasantly surprised.